Saving energy is not easy. It takes a lot of work and understanding. The purpose of this is to deliver information and anecdotes to help with that process. In the summer during daylight hours keep the windows covered to help keep the heat out. In the winter you would want to allow the sun to shine bright in the house, it helps to warm the house, but in the summer the sun would make the cooling system work harder. Make sure the heating and/or cooling system is working properly by having it checked by a professional. The system may appear to be working, but actually using more energy if it’s not working efficiently. Keep the filters clean. By keeping them clean the air will flow easier and be more efficient. Use a programmable thermostat. By using a programmable thermostat you can automatically turn down the heat when it’s least needed, at night when sleeping or during the day when no one is home. Have it raised to a comfortable level shortly before getting up or arriving home. Be certain that it is the correct type of programmable thermostat for your heating or coolong system. Some heat pumps and air conditioning systems require specialized programmable thermostats. In the summer a reasonable comfortable level for keeping the area is 76-80 degrees. For each degree that the thermostat is raised it can result in 3% savings on cooling. In the winter the comfortable level is 68-72 degrees. You can also save in the winter by setting it down even lower at night and use extra blankets when sleeping. Insulate and seal. Add an extra layer of insulation to your roof or walls, and use caulking, foam or weather stripping to seal cracks around windows, light fixtures or electrical outlets. If it's in the budget upgrade the windows. Old windows allows much more air to enter the house than new energy efficient insulated windows. When looking at the standard monthly costs of many businesses, three of the areas that has a great portion of those cost are lighting, office machines and the heating and cooling (HVAC) system. There are a couple of ways to do this is to take advantage of natural daylight. Turning lights off or dimming them during the day allows for lower energy costs and a more comfortable environment. Need more light on a work surface use task lights. The installation of occupancy sensors, timers, or photocells will ensure that interior and exterior lights are turned off at the appropriate time. These inexpensive devices can reduce lighting costs by up to 40 percent by turning off lights in unoccupied areas. In closets and restroom install motion sensors or timers so that the lights are off when no one is using the room. These can also be used in seldom used work areas such as copier rooms. This type of bulbs can last up to ten times longer and provide the same amount of light as standard incandescent bulbs. Replace incandescent lights in exit signs with LED fixtures, which can reduce costs of these signs by up to 95 percent. It doesn't get any more simpler than this. Turn them off when not in use. Turning off one computer and monitor nightly and on weekends could save up to $80 a year. It’s a good idea to set PCs, monitors and copiers to use sleep mode when not in use. Unless a computer is doing a critical function at night, such as a daily backup that takes hours or being used as a server, there is not a reason for it to be on. Turning it off will not allow the system to last longer, and will only be wasting energy. Choose ENERGY STAR® products when upgrading or adding new equipment. These products meet federal standard for energy efficiency, and are often available at the same low cost as less efficient models. LCD monitors uses much less energy that a CRT Monitor. The cost for a new LCD monitor will pay for itself in a short period of time. Also turn the monitor off when not in use or have the computer put the monitor and itself into power save mode when inactive for a period of time. Lower the thermostat temperature in the winter and raise them in the summer. Adjust the thermostat down in the winter and up in the summer and shut off when not in use. Even a few degrees can significantly reduce heating and air conditioning costs. Make certain that the thermostats are not blocked. It's not unusual for thermostats to be above filing cabinets and having books or paper arond them they aren't able to get a correct reading of the room air temperature. The room may be cold, but the thermostat may be warm and comfortable. Don't open windows and doors. If the area is too warm there may be a problem with HVAC system that needs to be checked. Or as stated earlier the thermostat may be blocked. These systems can automatically control temperature settings on heating and air conditioning equipment so that when the office is not scheduled to be in use the settings can be a a saving level. Steven G. Atkinson is the author of the book Technology Tips for Small Business. The book is an informational source for Small Business to better understand the technology they use everyday. More about the book Technology Tips for Small Business can be found at tt4sb.com. 1. Each year more than 380 billion plastic shopping bags are produced just for use in the United States. 2. Less than 35% of these bags are recycled. The rest will be thrown away, either to pollute the landscape on put in landfills. 3. Plastic bags are generally made from polyethylene and will take over 1,000 years to biodegrade in landfills. During this time they will emit harmful gases. 4. It’s easy to reduce the use of plastic bag, take a cloth bag or one made from plant-based materials to use each time you go to the store. 5. Chemicals commonly used by the plastic industry [propylene, phenol, ethylene, polystyrene, and benzene] are ranked as the chemicals that generate the most hazardous waste. 6. Countries that have banned or taken action to discourage the use of plastic bags include Australia, Bangladesh, Ireland, Italy, South Africa and Taiwan. Mumbai (formerly Bombay), India, also has banned the bags. Recycling can be an energy saver. On the surface you may not see a cost savings. It's not as if you will get much money back by recycling aluminum. Most places that will pay for aluminum wants large amounts for a small price. The savings comes from the cost savings from production of the cans. Here are 6 facts about Aluminum. 1. 100% of the beverage cans are made from Aluminum. The Aluminum can made its first appearance in the United States in 1953. Prior to this most cans were made from tin or steel. Steel cans were first used in the 1800’s. 2. On average each person will use about 390 cans per year. 3. Aluminum cans typically have a recycled aluminum content of about 55%. 63.5 % of aluminum cans are recycled annually. The number of cans recycled are 62.8 billion. 4. Recycling aluminum saves about 95% of the energy it would take to produce aluminum from its original source, bauxite. Recycling 1 can would save enough electricity to run a TV for three hours. 5. The Aluminum recycling process is so efficient that it can take as few as 60 days for a can to be collected, melted down and made into a new can sitting on a grocery store shelf. 6. Anything that is made from aluminum can be made from recycled aluminum. It doesn’t matter whether you consider Global Warming a fact or a hoax. The one thing for certain is that we do harm the environment every day. These are things we can do to not only save and conserve energy but also help the environment. American’s have become a very wasteful society. When our founding fathers were creating the nation in which we live, they didn’t waste anything. Washington at Valley Forge, the frontier families who settled west of the Mississippi even the families of World War II used everything. Today nearly every item that we purchase is in some type of disposable wrapper. It’s used once and thrown in the trash and using another piece of a resource that is diminishing. Even though by following these three ‘R’s’ one may not see a direct savings, the cost of products might be less. A recycled aluminum can require less energy to reuse than having a new one produced from the raw materials. There are a number of ways that we don’t drive smart. We are a mobile society and don’t always consider everything before we get in a vehicle to go someplace. How many of us have gone one place, come back only to realize we also need to go to another? Planning your trips will allow you to use less fuel as well as save time. One of the biggest consumption of fuel in a vehicle comes from poor maintenance. Have the engine routinely serviced will keep it running at peak efficiently? Don’t forget the tire pressure. Tires at the wrong pressure, especially ones that is low are a big fuel waster. And don’t forget to have the brakes checked. A dragging brake not only causes the brakes to wear out faster, it will make the engine work harder using more gas. When driving, don’t make rapid stops and starts as well. This, as well as exceeding the speed limit, can quickly reduce gas mileage. By using the speed control on long trips, the vehicle runs at a constant speed. Does the building have enough insulation? Older homes and building probably don’. Windows are also an area where energy costs are moving from their desired purpose to change the temperature of the outside air. Many homes are heating or cooling areas that are seldom used. By setting up heating and cooling areas, one can save money and energy by keeping the seldom used area warmer or cooler than the rest of the house. Many people may like a warm living room in the winter, but rather have a cool bedroom. This would be another reason for separate environmental areas. Use a programmable thermostat. By using a programmable thermostat you can automatically turn down the heat when it’s least needed, at night when sleeping or during the day when no one is home. Have it raised to a comfortable level shortly before getting up or arriving home. Be certain that it is the correct type of programmable thermostat for your heating or cooling system. Some heat pumps and air conditioning systems require specialized programmable thermostats. Water may be free, but getting it from the ground to the home costs a lot. There’s the cost of pumping it from one location to another. As well as the cost of treating it to be at a useable state. And the costs removing and cleaning the waste water. Many older appliances use a great deal more energy than a new one. The 20 year old refrigerator may be working fine, but a newer one could use half of the energy of the older one saving as much as 100 dollars per year or more. Water heaters can use as much as 14% of the energy bill. The older it gets the less efficient it is with one over 10 years being as much as 50% efficient as it was when new. And don’t forget the light bulbs. Most of the energy used by old style incandescent lights is turned into heat not light. A 15-Watt Compact Fluorescent Light gives the same light as a 60-Watt incandescent using a quarter of the energy. Unplug devices that use a transformer when not in use. Example; battery chargers. Whenever these devices are plugged in they consume minor amounts of energy. Many devices such as TV and DVD players still use energy when not in use. Unplug them when they won’t be used for a long period of time. Turn off computers at night, and use sleep mode as often as possible. When not in use turn off televisions, radios and other entertainment equipment. Office lighting, as much as anything else in the office, is one of the items that are the biggest user of electric each month. Reducing the energy used by lights can make a quick and noticeable impact to the bill. Many offices either use too much light or does not use the most efficient type of lighting. It’s important to have enough lights in an area so that it’s safe, but there may be places where lights can be removed, the size of the fixture reduced or more economical sources of light are use. Use task lights to reduce the amount of overhead lights. Task lights puts the right amount of light on the project at hand allowing the room lights to be at a lower light level, therefore saving energy. Don’t light areas that aren’t being occupied. Install times and occupancy sensors. These are great in offices for restroom, storage closets and copier rooms. A habit are those things that we do without thinking. Developing a habit takes time. At first it may take some constant thoughts and reminders. By spending time considering your actions and doing the things to save energy each day, these actions will become a habit. It’s amazing how many people there are out there that just don’t know, don’t have an understanding or just needs to have a person they know and respect to assure them. Pass along the information. Let your friends know when you replace an appliance and see a drop in the electric bill. Or when they throw a plastic bottle or newspaper in the trash let them know it can be recycled and used again. The more people hear it from someone they know, the more apt they are to follow the advice. When being the last to leave a room turn out the lights. It will always be saving energy with few exceptions also saving money. 1) Let the sunshine in. Open the curtains on the south windows during the day and the heat of the sun will help heat the home. 2) Keep the filters clean. By keeping them clean the air will flow easier and be more efficient. 3) Use a programmable thermostat. By using a programmable thermostat you can automatically turn down the heat when it’s least needed, at night when sleeping or during the day when no one is home. Have it raised to a comfortable level shortly before getting up or arriving home. 4) Upgrade the windows. Old windows allows much more cold air to enter the house than new energy efficient insulated windows. 5) Insulate and seal. Add an extra layer of insulation to your roof or walls, and use caulking, foam or weather stripping to seal cracks around windows, light fixtures or electrical outlets. 6) Lower the temperature of the hot water heater. The default settings of hot water heaters are 140 degrees, but at that temperature it could cause scalding. 120 degrees is plenty hot enough for showering and dish washing. When you talk with energy experts they will advise consumers to buy gas in the morning. Their claim is when it's cooler outside, you get more energy per gallon. The main reason for it us a 100-year-old government standard that calls for a gallon of gas to deliver the amount of energy gas has when it's stored at 60 degrees. That would be 231 cubic inches. But as gas gets hotter, it expands, diluting its energy and reducing miles per gallon. At 80 degrees it takes 234 cubic inches of fuel to get the same amount of energy. While the science is exact, it may also be true that gas companies are using it to their advantage. When delivering gas to the stations the gas is temperature compensated. Special equipment adjusts the amount pumped according to its temperature. This is not true when dispensing it into the vehicle. With the price of gas rising to record levels members of congress is looking into the issue. But for now it’s best to follow the advice experts have been giving for years. Purchase the gas in the morning, when the temperature of the fuel in the tanks at the station are at their lowest. One way to better understand the cost that a device uses in energy is to understand how electricity is purchased. Electric companies usually charge in kilowatt-hours or KWHs. It is a unit of energy equivalent to one kilowatt of power expended for one hour of time. This is equal to of having 10, 100 watt bulbs on for 1 hr. It’s not always easy to figure out how much energy is being used, therefore even harder to understand the savings. First you need to understand the cost that your electric company is charging. There may be a couple of different items that makes up the cost. For me, I discovered my cost by taking the total charge and divided it by the number of kWh used. Since this factored in some charges that are static, each month the kWh charge may be slightly different, but for a general idea this will work. In my case it came to 13.5 cents per kWh. Now you can do calculations on how much a device costs to use. Some electronics devices do not give the power in watts, but only amps. It’s a simple process to determine the wattage used. Multiply the amps by 120, for normal household current or 240 if it’s a 240 volt device. 25 watt night light on 24 hours a day. 25*24=600 600/1000 = .6 kWh. At 13.5 cents a day this light cost 8.1 cents a day or $ 2.43 for a 30 day month. 3-60 watt incandescent light bulb in the living room on 4 hours a day. 3*60*4=720; 720/100 = .72 kWh. At 13.5 cents a day these lights cost 9.72 cents a day or $ 2.91 for 30 days. 3-13 watt compact fluorescent light bulb (light equal to 60 W incandescent) in the living room for 4 hours a day. 3*13*4=156 156/1000 - .156 kWh. At 13.5 cents a day these lights cost 2.1 cents a day or $ .63 for 30 days. Using the above example if you replace the 3-60 watt incandescent bulbs with 3-13 watt compact fluorescent light bulbs the 30 day savings would be $ 2.28. A year savings would be $ 27.81. For most businesses their single most costly item is their electric costs. In some cases a business may have to spend some money to save it. But there are ways to save on energy costs without spending a dime. By doing an Energy Audit savings can be seen quickly by finding the energy wasting hotspots. When looking at the electric costs, there are three major places where it’s used. Lighting, Office Equipment and Heating/Cooling. Each area needs to be looked at individually as well as in total. * Reduce lighting by using task lights. * Turn off the lights when they aren't needed. * Use timers and sensors for seldom-used areas such as storage closets, conference room and rest rooms. * Shut off computers, copiers and other office equipment at nights and on weekends. If these items are always on just by turning them off during these times will reduce energy costs associated to Office Equipment by over 50%. While some computes, such as servers, need remain on at all times, the monitors do not. * Use Power Management on computers, copiers and laser printers. * Replace CRT style monitors with LCD monitors. * Don't open windows and doors. * Lower the thermostat in the winter and raise them in the summer. * Make certain that the thermostats are not blocked and can get a correct reading of the room air temperature. When performing and energy audit, it’s important to walk around the office with an energy checklist to help identify areas where savings cane be found. This walk around should involve the employees and done at different times during the day, during work hours as well as after-hours and on weekends. Since seasonal conditions may change it should be done on average once each season. Once the checklist is finished items needs to be itemized and prioritize. Those that can be accomplished quick and with little expense can be done first. Those that have costly upfront costs need to be part of the annual budget review and made part of the business plan. Myth: An idle computer doesn’t use much energy. Once a computer is on and operating there is little change in the amount of energy it uses while idle or when doing complex calculations. Another part of this myth deals with screen savers. Screen savers do not save energy unless they shut the monitor off or into stand-by mode. A monitor can use 50% or more of the energy used by the computer system and shutting it off when not needed can save a measurable amount of energy. Myth: It’s harmful to the computer to be turned off and on. This one of those ideas that once was true is no longer. Early computer technology was such that the shut down and start up of certain parts, especially a computer hard drive, would effect the life of that component. Technology has advanced and now while turning it off and on may shorten life, but the life has increase so much that the device will no longer be in use before that happens. Myth: It takes more energy to raise or lower the temperature in the house than keeping it constant. Many people won’t vary the thermostat temperature setting when they are away because of this myth. This turns out to be an easy way to save energy. You also don’t need to adjust the thermostat beyond the temperature you desire upon returning. It won’t make it get there quicker and if you forget to adjust it later, you would actually be using more energy. Myth: Compact Fluorescent Light Bulbs have poor light quality, makes noises and takes time to turn on. When people think of fluorescent lights they think of the lights in office buildings. The newer CFL bulbs are available in many different shapes and sizes. You can now easily purchase bulbs that deliver the same quantity and quality of lights of 25-125 watt incandescent bulbs. These bulbs use a lot less electric than their incandescent cousins as well as generating a lot less heat. They are quick starting, usually not noticeable, and run quiet. Myth: Fluorescent lights use more energy in starting than leaving them on. There is a slight surge of electric when turning a fluorescent light on, but that amount of energy would be equal to a short period of time. It depends on the type of starter, but it’s usually less than a few seconds. The part of this myth that rings some truth deals with the replacement cost of the light. The life of the bulbs is shorten by turning them off and on. One thought is that if the lights won’t be needed for 15 minutes or more it’s best to turn them off. Myth: Higher costs negate any savings. It’s true that many energy savings devices may be more costly than their usually used cousins, but in most cases the energy costs saved during the life of the product is great deal more than the added cost. It’s either pay now or pay later. Myth: Off is no energy used. In truth many modern appliances may be using as much as 15 to 30 watts when off or in Stand-by mode. 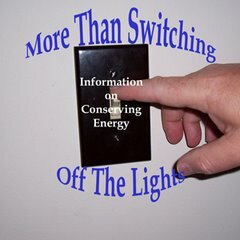 Some may actually be using the same amount of energy off as they are when on. Why Not Use Google Adsense? That was considered, but I decided not to use them because there was little control on what ads would appear. If you have an advertisement that you would like to have on this site, please contact me. Merchandise related to this site.